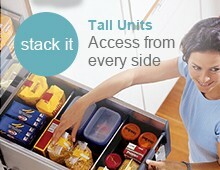 A double kitchen bin, ideal for 400mm or wider cupboards with restricted internal height. 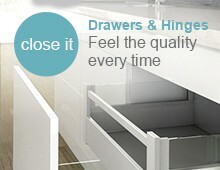 This versatile bin allows option of mounting to the door or installing behind hinged doors. 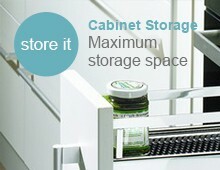 The double kitchen bin containers are suspended from a metal frame which sits on the cabinet base. The bin benefits from full extension and soft closing action, a lid which remains in the cabinet and doubles as a handy shelf. Waste bin comprises of two 15L containers for separating different kinds of waste. 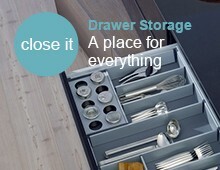 Integrated chrome handles secure bin bags and allows easy removal for emptying and cleaning. 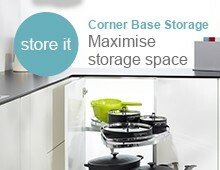 Simply screw the steel housing to the cabinet base, full instructions are included. 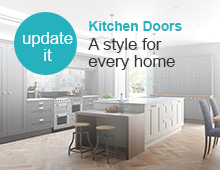 A minimum internal cabinet width clearance, of 393mm is required.